She is a sweet dog, great with the boys. She seems to be a recovering pacifier & bottle eater. She has even managed to leave Sophie the Giraffe alone. The last of which surprises the heck out of me. You see that mess above is her one bad habit, she is a food flinger. I have never had a dog do this before, I have had numerous dogs before her. It has driven me crazy for almost 6 years. I had to sweep my kitchen ever morning to gather up flung dog food. I don’t know how much dog food I have thrown away. As luck would have it Target’s Dollar Spot of all places had my answer. A raised lip boot tray. 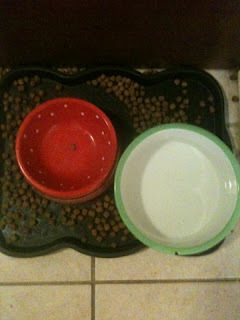 We have tried the flat placemat style mat for her bowls it did nothing. The boot tray seems to contain the mess, if only she would stop flinging her food. So if you have any food flinging animals in your house the boot tray is a cheap easy fix. They still had them last time I checked my local dollar spot and now in fun spring colors. This entry was posted in FootFoot, home. Bookmark the permalink.